Sickle Cell Society Suffolk is a community group made up of sufferers, parents, carers and friends of people with the Sickle Cell Anaemia or haemoglobin disorders. 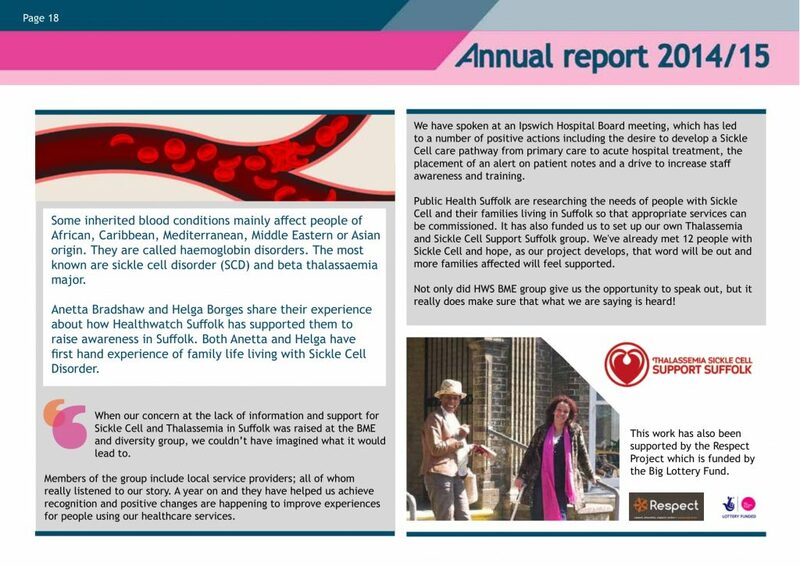 We started out as Thalassemia and Sickle Cell Support Suffolk, to share our experiences (good and bad) with service providers. Suffolk Family Carers, Karibu, Healthwatch and other organisations who were encouraging us and helped to put our case forward to Public Health. Public Health provided us with a small grant from the GAROD Project (Groups At Risk Of Disadvantage), while Healthwatch Suffolk continues to support us with publicity to raise awareness. We collaborate with Sickle Cell Society UK as they are the leading experts in this field. We are now known as Sickle Cell Society Suffolk following the ethos and practices of the well established Sickle Cell Society UK.